Carnet De Passage Malaysia – A Carnet De Passage is a document that allows you to cross international borders with a vehicle and avoid paying customs charges. It is basically a promise that you will take the vehicle out of the country when you leave, or risk hefty penalties. The carnet lists comprehensive details on your vehicle and its value and can be obtained from the local automobile association in your country. Often, a bank deposit is also needed. If you would like to have up to date information regarding carnet, please click on the link below. If you’re not applying for Carnet De Passage in Malaysia, please contact your local Automobile association. 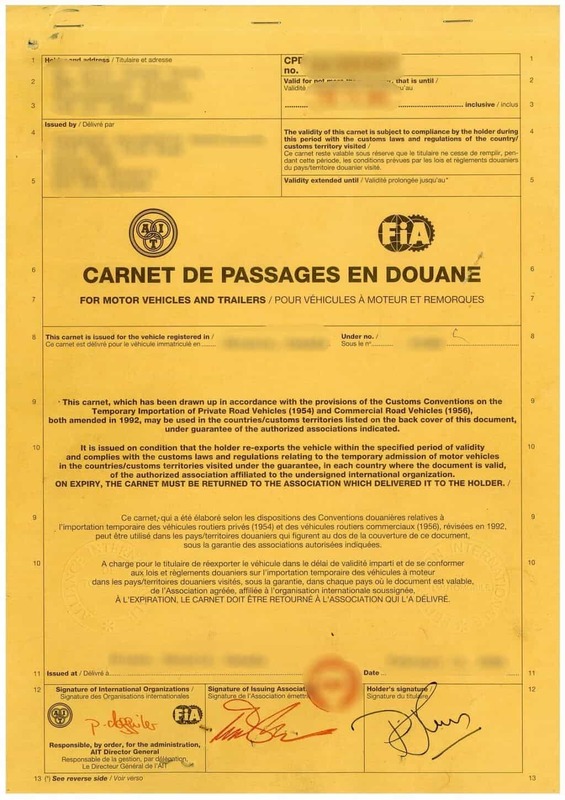 Below is the sample – Front cover of the Carnet de passage. 1. Authorized letter from the vehicle owner & copy of the owner’s N.R.I.C./ Passport (If the vehicle is not on your name). 6. Carnet deposit will follow the vehicle market value. You can try to negotiate with AAM. In the past, travelers had to place a huge cash deposit at the custom as a guarantee for not selling the vehicles. Upon exiting the country, the deposit is returned. With the Carnet de Passage, it eliminates the need to lug around so much cash. It will take them 3 working days to process the Carnet de passage, you can either collect it at their office or ask them to courier it to you.